← Poledancing: Trick or Treat? 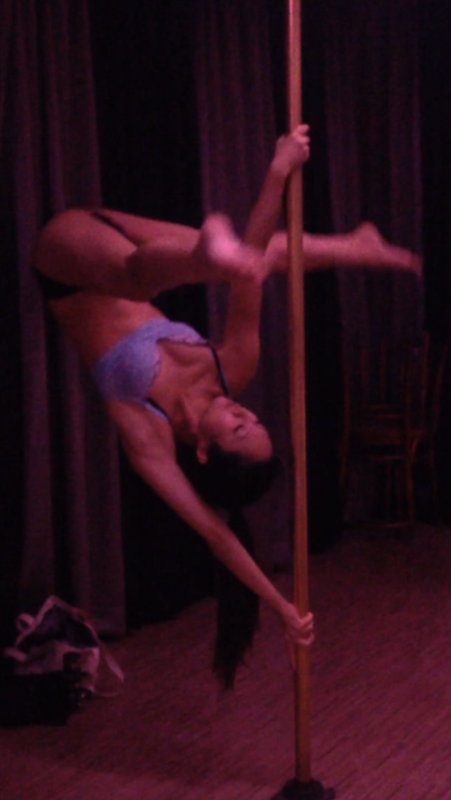 It doesn’t happen very often, but recently I’ve been on a roll with my pole progress! After months of working on Static V and being terrified of it, I no longer fear it and can happily do it on my own. And this week, I surprised myself by getting into a pole centre split from DVD cover. I’d thought it was going to take me some serious time and commitment to get it and decided to just try it out and gauge how far away I was from achieving it. But when my bottom ankle touched the pole and I realised I was in centre split position, I was so shocked that I momentarily forgot how to move! And last night, I tried a Cocoon, Ballerina, and some other pole split variation with the help of Miss Folly, so now I have a bunch of fun, painful new stuff to work on. I’m definitely not missing the unlimited pole class promo anymore! I know that I probably wouldn’t have been focused enough to work on the Static V so much if I’d been busy doing multiple classes like I used to. And I really feel that practicing diligently 3 times a week has made all the difference. So yay for more practice with less classes! How many classes v.s hours of practice do you clock in a week? This entry was posted in I'm just saying.. and tagged pole, pole dance, progress. Bookmark the permalink. Yayyyyyy for new tricks mastered. And to answer your final question: I take zero classes and tonnes of practice sessions. But it has done lots of good. Am sure you already know this anyway. Interesting idea- I know that I advocate for really focusing on the classes you are taking instead of loading up, but I love the idea of taking it a step further and really focusing on the specific things you are working on. Congratulations, by the way! Thanks Kim! I probably haven’t been this focused since I first got my aerial invert but I’m definitely going to continue like this now..